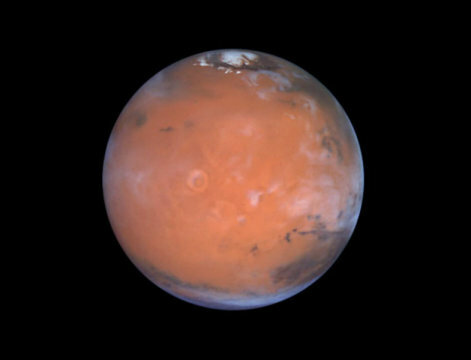 Recently, the University of New South Wales announced that it would source all of its energy from renewables. The announcement was notable not just for the scale of the purchase, but the fact that the University was committing to supporting one single giant solar farm that would offset all of its energy needs. Now, Fifth Third Bank is pulling off a similar trick, signing one single contract to source all of its electricity from a solar farm in North Carolina. Specifically, the bank is committing to buying about 194,000 megawatt hours of solar electricity from an 80 MW solar facility in Hertford County, NC—which should lead to $200,000 worth of investment in the state, and which will be up and operational by the end of the year. 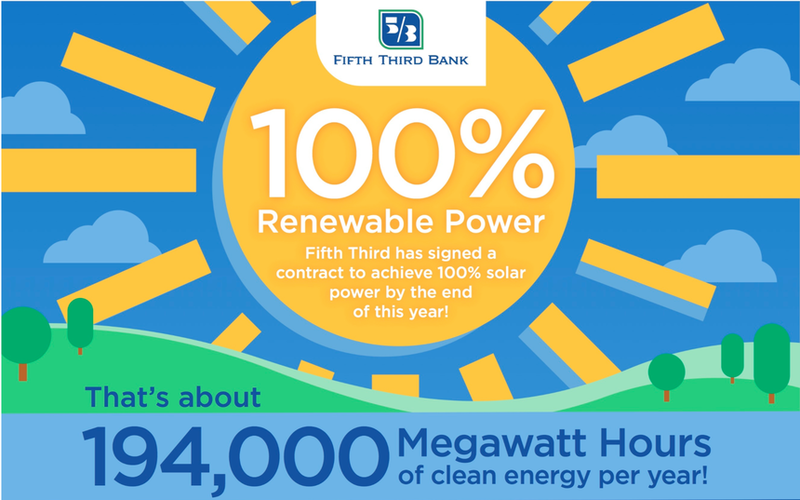 This also makes Fifth Third the first publicly traded company committing to reach 100% renewables through solar power alone. It’s worth pausing a moment to think about just how far we’ve come. It wasn’t that long ago that we found it amazing when a company like Ikea bought a 12MW wind farm. 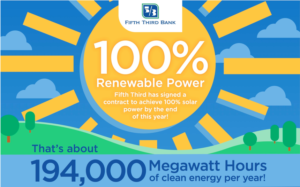 Now corporations are reaching their 100% renewables goals several years early and businesses like Fifth Third can essentially leapfrog direct to fully renewable electricity by signing a cost-effective agreement with one single provider. Given that even utility CEOs prodict new wind and solar that’s cheaper than existing coal in the very near future, I can’t be alone in assuming that more and more companies—regardless of how ideologically aligned they are—will sign Power Purchase Agreements (PPAs) that lock in their energy costs, and provide a nice public relations talking point in the process too. Like I’ve said before, the transition to renewable energy can’t be derailed. Now let’s pick up the pace. More than 400 schools across the Thai capital will be closed on Thursday and Friday because of the smog. Bangkok is now on the list of the world’s top most polluted cities.